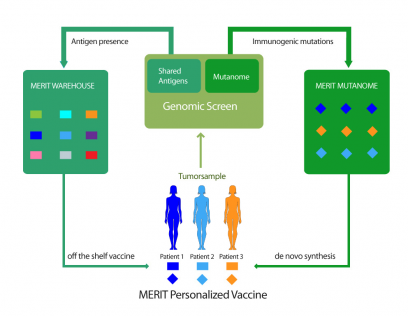 MERIT will focus on the development of a personalized vaccination approach, in which patients will be treated based on specific characteristics of their individual disease. To this aim, the individual tumor antigen signatures and mutations will be rapidly determined in clinical grade processes using latest technologies. The output of the profiling will be a patient-specific list of confirmed expressed antigens and immunogenic mutations. Based on this list, a cutting-edge platform technology will be used for the rapid design, manufacture and release of fully-tailored, pharmacologically optimized, GMP grade RNA vaccines. 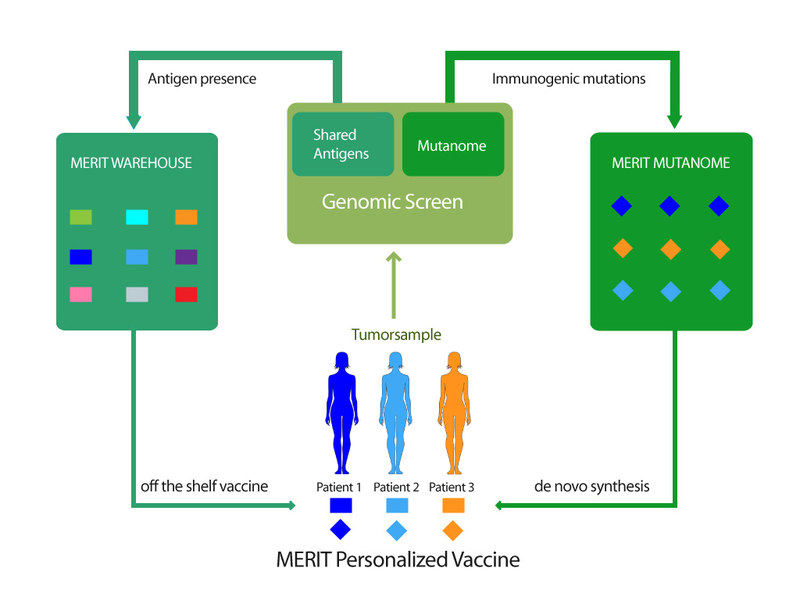 The MERIT vaccine features in vitro transcribed, polynucleotide “off the shelf” RNAs from a pre-furnished RNA vaccine warehouse (MERIT WAREHOUSE) that target shared tumor antigens expressed in the respective patient’s tumor. This is combined with RNA engineered on-demand that encodes patient-specific tumor mutations (MERIT MUTANOME). Recombinant RNA encoding vaccine antigens is emerging as particularly attractive vaccine format. RNA is taken up by professional antigen presenting cells, in vivo expressed as protein, processed and presented to the patient’s immune system, thus unleashing a comprehensive immune response against cancer cells. The RNA platform used by the consortium is based on favorable properties including a relatively simple RNA manufacturing process, pharmacological and pharmacokinetic optimization to induce potent cellular immune responses against tumor-specific target structures. In addition, RNA is rapidly degraded by ubiquitously expressed RNases and does not integrate into the genome leading to a favorable safety profile. The RNAs selected for the MERIT WAREHOUSE will address the tumor expression profiles in the majority of triple negative breast cancer patients. Each patient will receive a tailored selection of RNAs from a pre-furnished RNA vaccine warehouse that fits to the confirmed antigen-expression pattern of the individual tumor. Complementing the MERIT WAREHOUSE antigens, MERIT MUTANOME targets are neo-antigens derived from mutated epitopes. The mutanome vaccines will be manufactured on demand for each patient after identification of tumor-specific mutations.